Robust, vigorous, warm with life, a bison from Altamira. 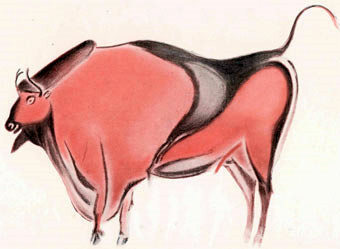 The æons that must be retraced before we reach the date at which this bison was painted make the whole of history as we know it seem like a crowded moment of action at the end of a long slow day; and yet it will compare with many a modern work, and in the comparison give a corrected view of a vaunted progress. It is the best preserved of the paintings in the Altamira cave.